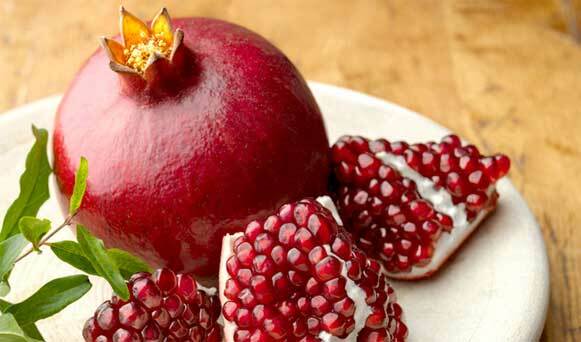 Health benefits of Pomegranate – Pomegranate is a fruit that contains many essential nutrients for health. Pomegranate has tiny seeds with a blackish red color. The fruits are coming from Iran and around the 1600 BC spread to Egypt. So, until now pomegranate still thrives in Egypt and can obtain easily in the fruit shop. Do you know what are the health benefits of pomegranate? Among the important nutrients in the pomegranate is an anti-inflammatory, anti-aging, and antioxidants. Pomegranate fruit saves many benefits for skin health and beauty. Other important substances in pomegranate are punicic acids, omega 5 (polyunsaturated fatty acids) that are useful to renew cells. Also, pomegranate is also a source of vitamin A, vitamin C, vitamin E, and a source of minerals. It is like calcium, phosphorus, potassium, iron, folic acid, niacin, thiamin, riboflavin, and folate. Pomegranate is not only useful as a healthy food alone, but also widely used as traditional medicine for more than a thousand years, pomegranate serves as a tonic to cure ulcer disease and diarrhea. Pomegranate juice contains antioxidants called anthocyanins and ellagic acid, compounds such as gallic acid, and flavonoids such as quercetin useful to protect the body from diabetes, heart disease, osteoarthritis and some cancers. Here are the greatest health benefits of pomegranate. 1. The benefits for a heart – Consume pomegranate in the form of juice has significant benefits for health, especially heart health. The content of Punicalagin in pomegranate able to keep arteries flexible and reduces inflammation in the lining of blood vessels. Pomegranate will reduce atherosclerosis, which is one of the leading causes of heart disease. Furthermore, the pomegranate fruits are also beneficial for blood flow by addressing arterial blockage. 2. Keeping blood sugar levels – Pomegranate is sweet because it contains fructose. However, unlike other sweet fruits that can increase blood sugar levels. Pomegranate Although consumed widely, still not showed a significant rise in blood sugar, so this red fruit is good to keep blood sugar stable. 3. Keeping blood pressure – It is Another health benefits of pomegranate. This fruit believe can keep the patient’s from blood pressure and reduce inflammation of blood vessels for heart patients. Moreover, be able to maintain the blood from clotting. 4. Protection of cancer – Health Benefits of Pomegranate to cancer. It is good to block cancer cells that come from free radicals because the nutrients in the pomegranate can expel free radicals in the body. The antioxidants in pomegranate important in neutralizing toxins in body and boost immunity. Also, the benefits of pomegranate also block aromatase, it is an enzyme that converts androgens to estrogen, an important hormone in the development of breast cancer. 5. Enhance immunity – Eating pomegranates regularly can boost immunity because pomegranate contains anti-microbial and anti-bacterial. Pomegranate is also able to keep mouth away from microbes and cleanse the mouth of the bacteria that cause cavities. Additionally, among the healthy fruits, pomegranate is the only fruit that can inhibit HIV infection. 6. Prevent anemia – Health benefits of pomegranate for anemia. Anemia is a condition in the body that get deficiency of red blood cell. Pomegranates contain iron that can be useful to increase the production of red blood and anemia. 7. Improve digestive health – Pom fruits is a miracle fruit for health, this fruit can maintain the healthy function of the stomach, heart and liver. High fiber content in pomegranate makes it a super fruit for digestive health. 8. Good for prenatal care – Health benefits of pomegranate to pregnant women. Pomegranate is a source of essential nutrients for pregnant women, the nutrients in the pomegranate including folic acid that is an essential element of prenatal diet. The content of potassium in pomegranate juice may also prevent leg cramps that often occur in pregnant women. 9. Anti-aging benefits – Diet Pomegranate fruit is excellent for your health and beauty. Pomegranate juice that rich in antioxidants can cope wrinkles and fine lines on the face that caused by sun exposure. Red pomegranate is also beneficial to maintain the regeneration of skin cells and prevent the occurrence of hyper-pigmentation and dark spots.